If you want to study for your VCP or VCDX exams, you really need a lab in which you can test what the study material is talking about. Hopefully you have a test environment at work that you can use, but if not, this blog post will help you put together your own homelab. Before planning a lab, you first have to know what you want to do with it to be able to write down your requirements. 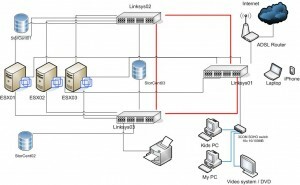 Will this lab be a short term lab that you are only going to use for the VCP or VCDX exam prep and will you not be using it much afterwards or are you going to use the lab also for hosting some VMs that you use at home and will you be using it to test new products and maybe even competing hypervisors? – Enough RAM to run at least 4 VMs concurrently. What servers should your lab be able to host? To work with ESX you would of course need at least one ESX VM, but since you will probably be testing more than just an ESX installation, you will need at least two ESX VMs, vCenter Server and a VM running a shared storage appliance like OpenFiler or FreeNAS for example. With this setup you can play with VMotions, HA, DRS, iSCSI, NFS, templates, cloning, Alarms, etc, etc. Actually you can do almostÂ everything you could do in a production environment, just don’t expect any performance and the number of VMs on ESX is low, but it will get the job done. Instructions on how to install ESX(i) on VMware Workstation 6.x can be easily found using google. And VMware Workstation 7 supports the creation of special ESX VMs so you donâ€™t have to do all the magic tricks to get vSphere running in a VM. During install ESX checks the memory requirement of 2 GB, which means that when installing ESX inside a VM, you will have to assign 2GB RAM to that VM. After installation has finished however, you can lower the RAM of the VM by changing the RequiredMemory value in ESX or add the line /vmkernel/minMemoryCheck = “false” in ESXi. For exact instructions see: Yellow-Bricks.com for ESX and search the comments for Mark Weaver’s tip on how to change this for ESXi. Reading the comments you see people bringing down the amount of RAM to 1480MB for the ESX VM. Running vCenter Server inside a VM should be able with 768MB. Although in a production environment you might want to run vCenter virtual on ESX, it is recommended to create a separate Workstation VM for vCenter and not run it as a VM in the already virtual running ESX. You will need Windows Server (2003 / 2008) and MS SQL Express as database and maybe also install an Active Directory in it. The VM running OpenFiler or FreeNAS can usually run with as little as 256MB RAM, which makes the total of RAM needed for these four VMs around 4GB total, but Iâ€™ll bet with some more squeezing you can run it with less RAM, but the more RAM you have the smoother things run. If you decide to go for a bigger home lab that will be used for more than just simple vCenter and ESX testing, you could go for a lab build with white boxes and if possible a NAS for shared storage. When buying a pc or a real server to use in your lab, it will be difficult to find a reasonable priced server that is on the VMware HCL of supported systems. You could do a search on eBay for old systems that are still on the HCL but since the requirements for vSphere have changed to at least 64bit and support for AMD-V or Intel-VT, chances are slim that you will find a reasonable priced system. And let’s not forget about the power usage of a â€œrealâ€ server in your home lab. When you decide to get a whitebox it is not that expensive to get at least 8 GB RAM in it and when selecting CPUâ€™s keep in mind the VMware Fault Tolerant feature which would be nice to be able to test in your lab. To give you an idea, my last addition to my home lab was a whitebox with Intel Q9440 CPU, 8GB RAM and 650GB harddisk for around 600 Euroâ€™s. The above mentioned boxes arenâ€™t too expensive, the smallest Iomega IX2-200 with 1 TB storage is available for 249 Euro Â and they all give you the opportunity to learn how to use iSCSI and NFS on ESX. Since it is shared storage you can also do VMotions and Storage VMotions and play around with Vmware HA. If these boxes stretch your budget too much, you can also use a virtual SAN. A virtual SAN or virtual appliance SAN is a VM that can build iSCSI targets on your ESX local harddisks and present them to your ESX hosts. You now have shared storage running on one of your ESX hosts without the need for a NAS. There is one drawback that the ESX host running this appliance will be your single point of failure for your shared storage, but for lab environments this might not be an issue. -Â Â Â Â Â Â Â Â Â Lefthand VSA is one of the earliest suppliers of a virtual SAN. http://h18000.www1.hp.com/products/storage/software/vsa/index.html 30 day trail. Studying for your VCP / VCDX requires a lab and as youâ€™ve just read, there are several ways to build such a lab. You can go for the almost free option of running everything inside VMware Workstation or build a permanent lab with shared storage for under 1500 Euro. There are many other blog post talking about peopleâ€™s ESX whitebox or their homelab and most of them are willing to help you out making the right choice. VMware alarms, box, cloning, drs, ESX, freenas, home, homelab, host os, lab, linux windows, mac osx, openfiler, production environment, storage appliance, study material, test environment, vcdx, vCenter, vcp, Virtual Center, vm, vms, VMware, vmware player, vmware workstation, vsphere, white, whitebox, wizards. permalink.